Welcome W&M President Taylor Reveley welcomes attendees to the Virginia Coastal Policy Clinic workshop. Photo by David Malmquist. Discussion Dr. Kirk Havens (L), Asst. Director of VIMS' Center for Coastal Resources Management, speaks with Virginia Secretary of Natural Resources Doug Domenech prior to the conference. Photo by David Malmquist. Tort Claims Chris Olcott, Virginia Sea Grant Summer Legal Fellow, discusses tort claims with conference attendees. Photo by David Malmquist. Building Cooperation and Collaboration on Adaptation David Bailey (L) and David Bookbinder (R) of Element VI Consulting discuss how to build cooperation and collaboration when taking steps to adapt to sea-level rise and coastal flooding. Photo by David Malmquist. Dillon’s Rule Professor Ron Rosenberg of the W&M Law School discusses Dillon’s Rule with conference attendees. Photo by David Malmquist. A Locality Perspective Skip Stiles of Wetlands Watch (L) introduces session panelists. From L: Jim Redick, CEM Director, Norfolk Emergency Preparedness and Response; Joseph DuRant, Deputy City Attorney, Newport News; David Hansen, Deputy City Manager, Virginia Beach; and Lewie Lawrence, Executive Director, Middle Peninsula Planning District Commission. Photo by David Malmquist. VIMSers VIMS assistant professor Chris Hein (L) enjoys a lighter moment with Project Manager Ron Herzick (C) and GIS Programmer Dan Schatt (R) during the VCPC Conference. Photo by David Malmquist. Sea-level rise is an incremental process with major long-term impacts. Heavy turnout at a September 13 conference on coastal flooding suggests that Virginia’s outlook on the issue is taking a similar trajectory, with years of local meetings and projects now building to the groundswell needed to initiate a state-level response. 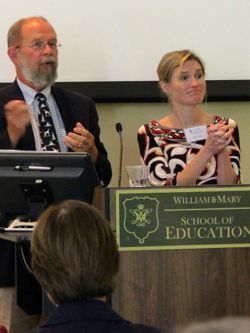 The daylong conference, Adaptive Planning for Flooding and Coastal Change, drew a capacity crowd of more than 230 elected and military officials, attorneys, scientists, legal scholars, business leaders, and concerned citizens to William & Mary’s School of Education. 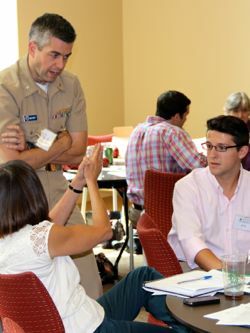 It was organized by the Virginia Coastal Policy Clinic, a partnership between the W&M Law School and the Virginia Institute of Marine Science, with funding from the Virginia Environmental Endowment and Virginia Sea Grant. Bringing the problem home to conference participants were a flood of speakers from throughout Tidewater Virginia, including Delegate Chris Stolle of the 83rd District, mayors Paul Fraim of Norfolk, Will Sessoms of Virginia Beach, and Molly Ward of Hampton, and a host of city and emergency managers. Sessoms says “It’s a major issue for all of us.” Given the long-term planning horizons needed to elevate roads, electrical and sewer systems, storm-drains, and other municipal infrastructure, he says “we have a relatively short window of opportunity, 20 to 30 years,” in which to act. Conference speaker David Bailey, former chief of climate policy for ExxonMobil and now a partner in Element VI Consulting, put that time frame in perspective, noting that one of Europe’s largest flood-control projects—the Thames Barrier near London—was begun in response to a catastrophic 1953 flood but not completed until 1982. Joseph Maroon, Executive Director of the Virginia Environmental Endowment, compares the situation to parents buying a college plan for their newborn. “With so much at stake here—public safety, infrastructure, tourism, the military, housing, insurance—we’ve got to get started now.” “Everyone’s interests are served by helping those communities that are in the crosshairs,” says Maroon. Joining the elected representatives at the conference were a number of practicing attorneys and legal scholars, who identified the potential issues involved in local and state-level responses to sea-level rise and coastal flooding—with Dillon’s Rule and the idea of “takings” dominating the discussion. Professor Ron Rosenberg of the W&M Law School says the central point of Dillon’s Rule is that local governments—cities and counties in Virginia—“derive their governing power from delegation by the General Assembly.” Thus, steps a locality might take in response to flooding—building a new pump station or widening a resource protection area, for instance—may be vulnerable to legal challenge unless the authority for the action can be shown to flow directly or indirectly from that body. The discussion of “takings” was led by Lynda Butler, Chancellor Professor at W&M Law School, and Sharon Pandak of Greehan, Taves, Pandak & Stoner, PLLC. The concern is whether restrictions on rebuilding in a flood-prone area following a storm could be construed as the unconstitutional taking of a private landowner’s property without just compensation. Despite the diversity of opinions expressed during the conference, the speakers did agree on at least three things—the complexity, cost, and value of a state-level response to coastal flooding and rising seas. “Water is coming through our citizens’ doors,” says Stolle. “The question now is what are we going to do about it.” “Our future does depend on the solutions we come up with to these problems,” says Fraim.